i charge laughing - The Archive: On no, look what you've gone and done! On no, look what you've gone and done! 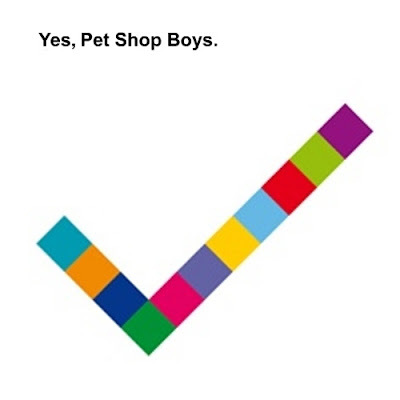 A few weeks ago, I wrote about my almost-lifelong love of the Pet Shop Boys, and though I realize that not many of my readers share such a passion, I also mentioned that I would be reviewing their latest album, so now that time has come. Yes, the Pet Shop Boys' 10th studio album, is a dance-pop masterpiece. It is by far their best album since the brilliant Very, and is probably the second best album of their career. From the opening beats to the closing measure (which ends darkly on the word "Amen"), Yes pulses with joy and fun. The first single, "Love, etc.," with its shouty chorus and is percolating beats, stands out as a stellar PSB song. It is a little different from previous releases, but still clever and addictive. "All Over the World" oddly starts out with (and continues a sample of) part of Tchaikovsky's Nutcracker, and then moves on with a downtempo pump about it. Handclaps add to the rhythm, as Neil Tennant's unmistakeable voice sings out, "This is a song for boys and girls . . ." And a great song it is. "Beautiful People" is the first of four songs on the album to feature the guitar work (and harmonica!) of Johnny Marr(! ), and this song sounds a bit darker, but the melody of the chorus really makes me very happy. And the orchestra arrangement in the background is quite nice as well. Second single "Did You See Me Coming?" is straight up dancefloor pop, complete with thumping bass and laser sounds. Fun. Fun. Fun. "More than a Dream" begins with just bassline and beats, and develops layers upon layers until the fantastic chorus, which sounds a bit like an Obama ad: "I believe we can change. / It's not as strange as it may seem." "This Used to Be the Future" is a strange and ominous sounding song, with odd vocal distortions, and both Neil and Chris adding their voices. The song starts off in a dreamy, ethereal way but then turns dystopic and weird, in a great way. And halfway through the song, things get even more dark, with Chris yelling out "But that future was exciting . . . " and one realizes that this is not a typical PSB song. But the best song on the album, and one of the group's best songs ever, is "Pandemonium," a bass-heavy dance love song with horns galore, harmonica interludes, and a wonderful melody. I love everything about this song. Yes -- the title says it all. "It's always something with you people."